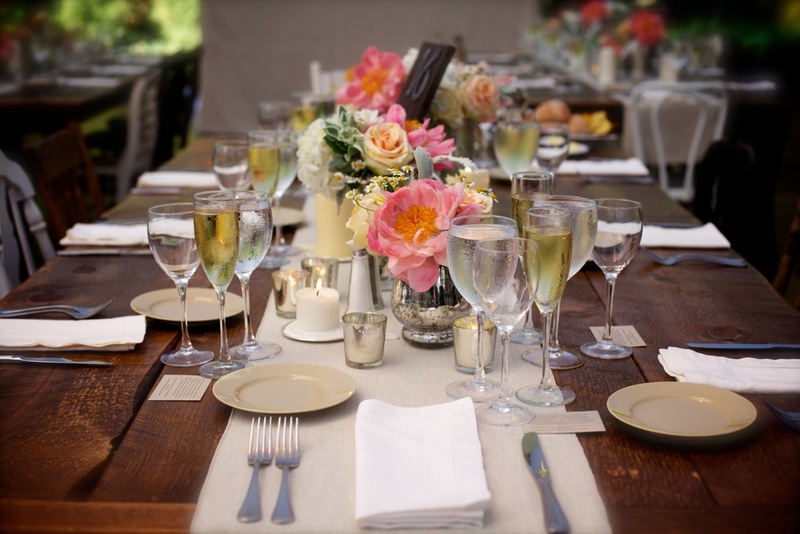 The word tablescape is often used interchangeably with terms like tabletop arrangement, tableaux or centerpiece. However, a true tablescape is actually a bit more complex. While tablescapes often adorn the center of the table, they are more than centerpieces. It is setting the stage for an overall look that addresses the entire table or surface as well as complementing its surroundings. 1. Sense of balance. The table does not need to be perfectly symmetrical; it’s more about repeating scale, textures and color. Our eyes naturally follow objects in a smooth movement rather than in jumps. To keep your tablescape balanced and pleasing to the eye, the varying heights should be 6-8 inches from each other. 2. Each item within a tablescape relates to the other elements around it. While the objects in tablescapes do not necessarily have to match perfectly, they should harmonize or complement each other. This achieves balance. But don't overload the table with too many extraneous objects. Step back and edit yourself. 3. To cover or not to cover? Not every table needs linen. If you are leaning toward a country feel, consider using a wood farm table. Incorporating a stainless steel prep table will command attention to what you place on the table. 4. 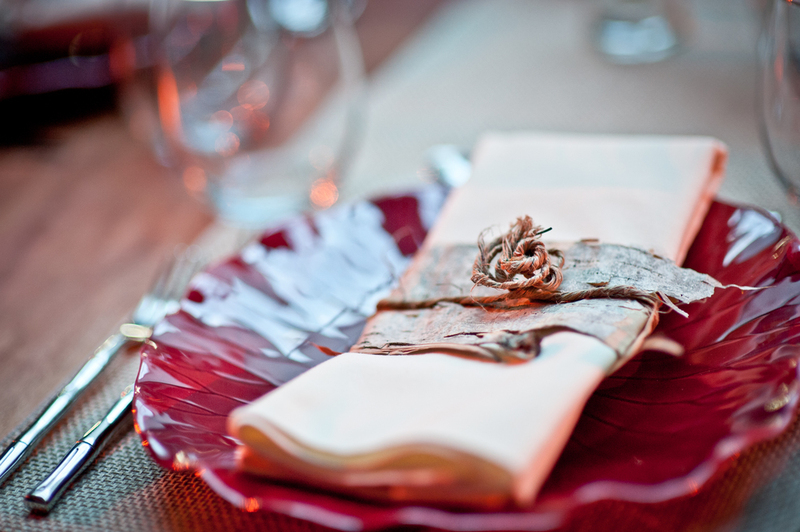 Get creative with napkin rings. Tie up linen napkins with a natural bark band and tuck in sprigs of rosemary, sage or small flowers. To reduce clutter on the table, remove these elements about ten minutes after the guests are seated. 5. Long tables are increasingly popular, but the cost of filling them with embellishments is not. You don’t need to fill the entire space along the middle of the table to create a stylish look. Try repeating a small element at regular intervals – natural elements: apples, small flower clusters or varying heights of candlelight works beautifully keeping the design clean and chic. 6. Desire to be inspired. The fashion and design industries are in the forefront for setting trends. They are not restricted to clothing, furniture and accessories; they extend to cover almost anything that has to do with public appearance. Follow these industries and don’t stop in the United States, broaden to Europe and Asia. 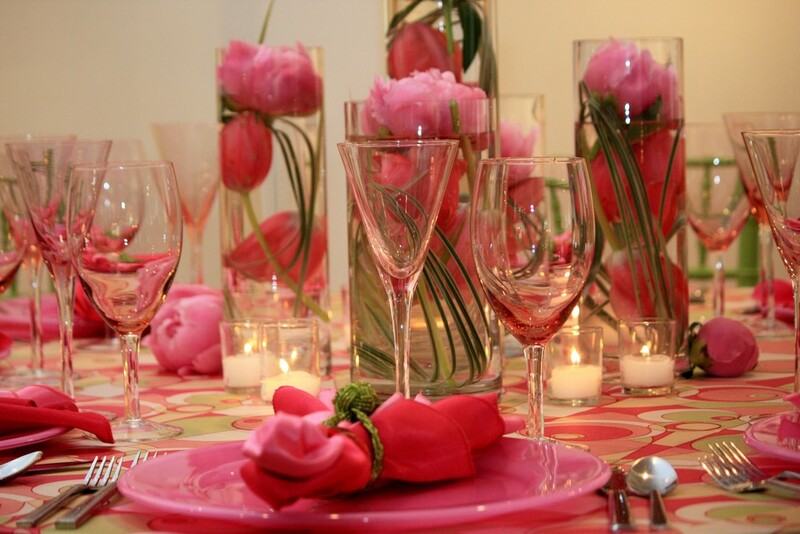 Tablescapes can bring your event together with color, style and dimension. So, stir your imagination and design with intention! Fun Fact: You hear about the Pantone color of the year, but have you ever wondered who actually decides this?